Our arboricultural team assisted Newtownabbey Borough Council with surveying and confirming that a number of chestnut trees were dead as a result of an increasing prevalence of Bleeding Canker, a fungal related condition that our tree survey experts have identified as affecting a growing number of chestnut trees in recent months. 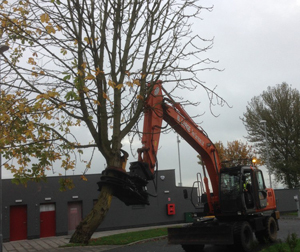 M.Large were asked by long time client, Newtownabbey Borough Council to survey a number of trees suspected of being at risk in terms of their position overhanging a main carriageway and their state of health. 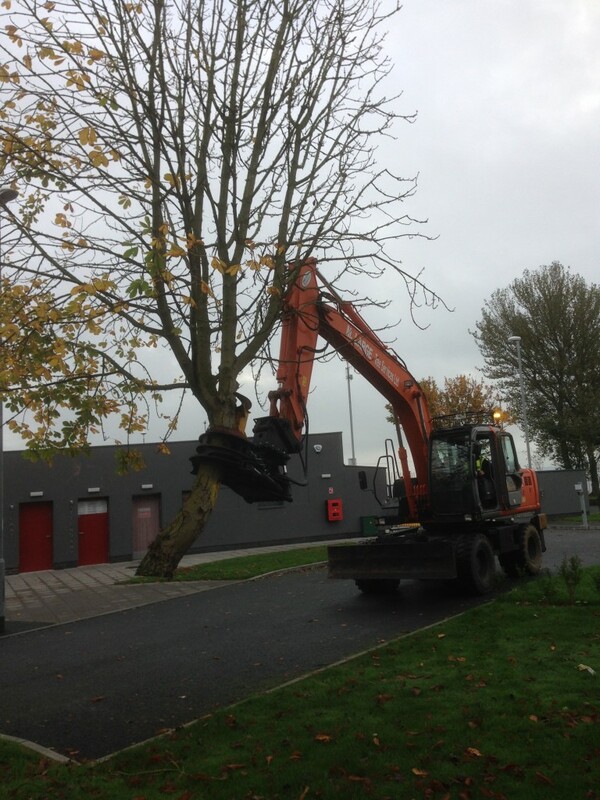 As part of the project a further approx 20 trees, some up to 60ft were also felled to allow the council to progress plans to develop the aesthetic appearance of the site for future visitors. Once the project was defined M.Large deployed a range of equipment to make the job more efficient and to remain acutely aware of the prevailing conditions of the site. The tree works team made a short journey by road to the site with a rubber wheeled 16ton excavator equipped with an LMS Scorpion 440 Tree Shear attachment. The shear with a cutting capacity of up to 440mm (developed and marketed through M.Large’s machinery division), was able to cut through most trees without the need or labour costs of a large chainsaw squad or climbers or any associated health and safety implications. The Scorpion 440 shear’s built in grapple function proved most useful in maneuvering sheared sections and even whole trees for further processing. Using the shear had the added advantage of reducing ground damage from felling as with shearing, the tree is cut clean, gripped and carried from site in a controlled manner without impact. The rubber wheel excavator was used due to the need to move it across an asphalt area without damage. This care for customer property was continued further in the deployment of a number of newly acquired grass guards for the heavy plant to rest on without damaging the important concerned grass areas,as used for caravan pitches for the council’s tourism business. 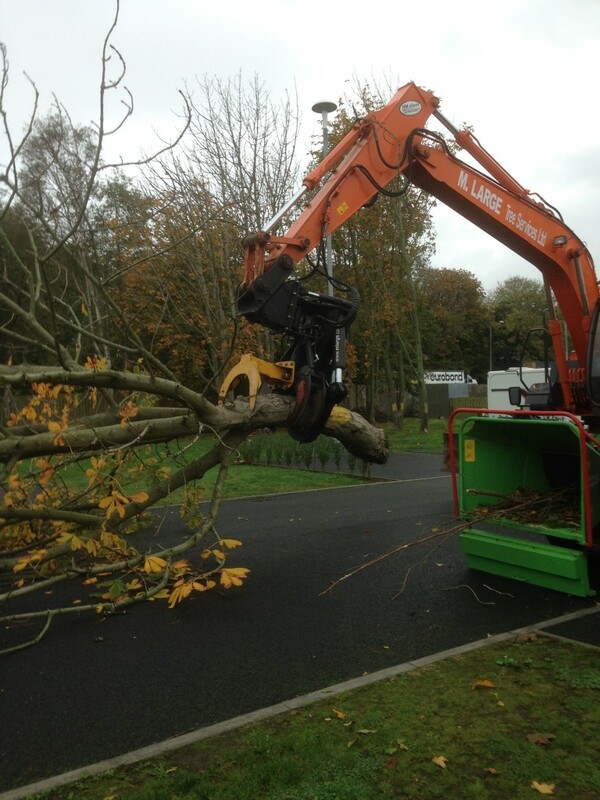 The large sheared wood sections were removed from site by timber lorry and smaller sections were chipped on the site using a Greenmech 1928 chipper. It is this day to day use of robust forestry and firewood machinery that places M.Large in a unique position of being able to stand testament over the durability, reliability and overall quality of the machines we recommend and market to customers from our machinery division.